How fast do you knit? How much knitting can I get done while riding from Rochester, NY to Portland, Maine? 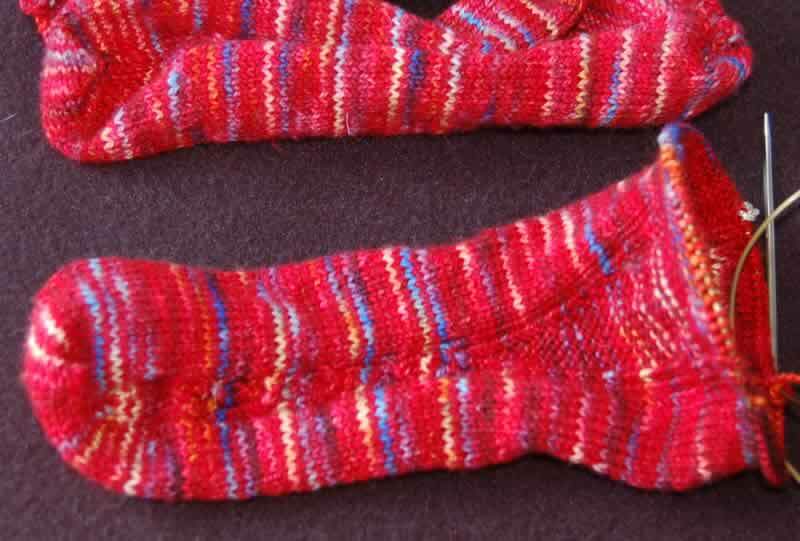 I can cast on a toe-up sock and work the toe, foot and gusset. This will help me guesstimate how long it will take to knit a pair of socks using an intermediate -difficult pattern. Let me explain. I am not a speed knitter by any means, but I am not slow either. I knit because I enjoy it and it relaxes me. But last week when I was catching up on my blog reading, Purl Diva had to show me this: the SKP: Sock Knitters Pentathlon (click button below for Yahoo group). The basic idea is to "challenge yourself by knitting in ways you don't normally knit and in the process become a better, stronger knitter". We will knit 5 different pairs of socks over the next 9 months. The patterns will be released at predetermined times, each about 2 months apart and will be intermediate -challenging in difficulty rating. As you finish a pair, you are given a number (first person done = 1, second = 2, etc). At the end of the year, the person with the lowest score wins the Pentathlon and some fun prizes. So far there are over 500 participants from 30 countries. Do I expect to "win a medal"? Of course not, but it will be fun "racing"! Here is my yarn for SKP Sock 1 (needed to be solid/semi solid). It is "Jitterbug" from Colinette (color: Velvet Damson 118) which I have not knit with before, so I will be checking my gauge this week. PS...I think it will take me a minimum of 1 week to knit a pair of socks and not neglect the rest of my life.